SCP-280 losing physical cohesion during initial capture. Special Containment Procedures: SCP-280 is to be contained in a 5 x 5 meter cell, and no equipment of any kind is to be left inside when staff are not present. Containment area is to be kept in total darkness at all times. Any items taken into the containment cell must be removed by staff at the end of testing, and any staff entering into containment must wear infrared goggles and be equipped with an infrared ID strobe and a strong flashlight. In the event of an SCP-280 attack, all staff are to power on their flashlights and illuminate the subject under attack. No aggressive action is to be taken against SCP-280, and staff are to keep one meter from SCP-280 at all times. Staff should continue to illuminate SCP-280 until it retreats to a sufficient distance to allow the recovery and extraction of the subject of the attack. Description: SCP-280 is a black human-shaped mass with two large white eyes on the head and two hands with very long and thin fingers. 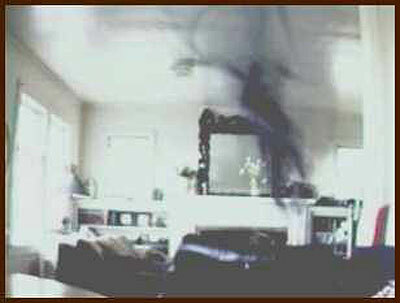 No feet or legs are visible, as the lower portion of the body appears to fade away several centimeters from the ground. SCP-280 appears to be wholly composed of matter that can gain or lose corporeal form. This matter is very black, with only the eyes showing any other color, and when changing to a non-corporeal form, looks much like smoke. The eyes are non-functioning, and appear only when SCP-280 is retreating, appearing to be used like eyespots on some insects. SCP-280 is very strong, and has been observed pulling apart steel with its hands, showing no sign of stress. SCP-280 moves with a gliding motion, with its hands extended, described as a “sleepwalker pose” by observers. SCP-280 will move slowly towards any human beings and attempt to attack them. SCP-280 appears to sense human life; no limit has yet been found on this ability. SCP-280 will approach to within 14 centimeters of a subject, and then use its hands to pull and tear at the subject, causing massive physical trauma. The attack can last between one and five minutes, and will continue until the death of the subject, at which point SCP-280 will expose its eyes, lose corporeal form, and move to the next human. If no humans are present, SCP-280 will move and ball up against a wall or other structure until a human being is again present. SCP-280 will retreat slowly from light, exposing its eyes in the direction of the light, or at any nearby humans. This has been described as extremely disconcerting by those who have been stared at. If the area that SCP-280 currently resides in becomes fully illuminated, or there is a very bright burst of light, SCP-280 will fade away and re-appear in another area. This appears to be done purely as a defensive response to light, and will not be used to follow or attack prey. SCP-280 does not appear to eat, breathe, or sleep. It does not ingest any of the tissue removed during an attack, and simply drops it to tear a new piece. Due to its ability to become incorporeal at will, and its aggressive nature, no samples of SCP-280 have been collected. SCP-280 was recovered in ██████████, Mississippi after several reports of locked-room murders and child deaths. All were reported as being extremely vicious, and victims were "horribly mangled." The Foundation became involved after a family of five was murdered in their home. A survivor was found in the basement, 9-year-old David ██████, who had come over for a sleep over. He was found in an advanced state of shock, holding a flashlight and unresponsive to outside stimulus. During an investigation of the basement, an officer was attacked and badly mutilated. His statement attracted the interest of Foundation agents. During recovery, SCP-280 was temporarily lost due to its ability to teleport when exposed to high levels of light. It was also observed that SCP-280 is frequently discounted as a shadow when seen in the dark, or dismissed as clothing, hair, or another object when accidentally touched in the dark. When tracking a subject, SCP-280 will remain incorporeal until the moment of attack, causing some to walk very close to or through SCP-280. Subjects report a feeling of dread and unease when inside SCP-280. SCP-280 usually does not respond to this, but will sometimes expose its eyes and enter its retreating posture when passed through. No pattern has emerged for this behavior. During a series of extensive testing of the effects of various illumination sources on SCP-280's retreat reflex, SCP-280 broke containment. SCP-280 was observed to repeatedly appear and dissipate throughout the illuminated Site, progressing through the sub-levels and eventually appearing in SCP-1591's containment chamber. Upon being exposed to SCP-1591, SCP-280 displayed its eyes but did not retreat. The entity paused and knelt for several minutes before demanifestation. SCP-280 reappeared in its cell several hours later without incident.